Good Tastes of Tuscany… a “Cooking Class with a difference”, will be showcasing its culinary programs and cooking talents at the Metro Cooking & Entertainment Show to be held at Washington Convention Center, Washington DC , USA from November 13-14th 2010. There are thousands of cookery treats and giveaways in store for the customers who visit the Metropolitan Cooking & Entertaining Show. They include several hundred exhibitors; live cooking demonstrations, tasting workshops, food and wine pairings, celebrity events, events for kids and various food and wine related seminars. There are general admissions and special ticketed events. Good Tastes of Tuscany can be found at Stand # 704 where they can provide information on their wine tours, olive oil tours, and most importantly their popular cooking classes that include Single day, Multiple Day and a 7 Day Culinary Adventure. They will be doing “live demonstrations” of fresh pasta making giving you just a ‘taste’ of what they offer in Tuscany during our classes. Encompassing the old with the new, blending modern cooking technology with ancient culinary wisdom has been the principle on which this cooking school has operated from the kitchens of a wine and olive oil farm called the Villa Pandolfini Estate, located near Florence in Tuscany Italy. In keeping with the times, the Good Tastes of Tuscany by Connextions Group Inc can be followed on facebook, twitter and their recent technological foray is the free application ‘Tuscan Foods’ which can be downloaded free onto your iPhone. The Metropolitan Cooking & Entertaining Show is open to the public from 10am to 7pm on Saturday, November 13, 2010 and from 10am to 5 pm on Sunday November 14, 2010. “ABC”, anything but chardonnay, was a term readily bandied about the wine world a few years ago. To some extent justifiably so, given some of the insipid and over-oaked wines produced from the queen of white varietals. Chardonnay, thankfully, is on the road to redemption. Driving this shift is that many chardonnay producers – especially those typically classified in the “value” category, today are making better wines than ever from this prolific grape. Contributing to its perennial hold on white wine dominance is that the chardonnay grape has been planted widely in wine-growing regions previously dominated by indigenous varietals, such as Italy’s Alto Adige. So while all this has been good for chardonnay consumers, sadly, varietals that were just beginning to be recognized, that is consumers began exploring and buying them, run the risk of falling back into the relative obscurity from where they originated. This means that only the locals, and a few aficionado’s of the vanishing varietals, can find or bother to uncork them. When was the last time you pulled a bottle of gruner veltliner, or one of Italy’s “three V’s” – vernaccia, vermentino, or verdicchio, from your merchant’s shelf, or ordered a bottle at the local bistro? As I suspected. I don’t buy enough of the “lost varietals” either. Shame on both of us. These are delicious and distinctive wines, worthy of our wine consumer dollars, but we continue to wallow in a “big three” rut (chardonnay, sauvignon blanc and pinot grigio ) when it comes to white wines. I remember not so long ago while on a wine shopping excursion asking a friend whether he had tried a particular gruner veltliner and he replied, “I never drink anything I can’t spell.” Ouch! That hurt. After all, this wasn’t trockenbeerenauslese, or even gerwurtztraminer. For those of you who haven’t tried the delicious “V” varietals lately (or at all), they have improved remarkably in the last few years. A little about these wines and some producers to look for. Note: Producer recommendations are based on wide-distribution and those I have tasted. Check with your retailer for options in your area. Also, better Italian restaurants will have the vermentino, vernaccia, and verdicchio on their list. Go ahead, explore! The most widely planted white varietal from Austria, and grown successfully in many Eastern European vineyards, gruner veltliner is a mouthwatering, light to medium-bodied, slightly spicy wine that is especially food friendly. It’s surprising that this varietal isn’t getting a lot more play given that it is a current darling of sommeliers in the finest restaurants in this country and abroad. Top producers include: Winzer Krems, Familie Brandl and Laurenz. It is almost impossible to visit Tuscany, especially the medieval, 11th century, walled-city of San Gimignano, and not have enjoyed a chilled bottle of one of Italy’s earliest varietals, vernaccia. Like any number of Italy’s wines, it is only in the past ten years, that vernaccia is being produced in what could be considered a consistent style. The better labels are rich and full-bodied, often redolent of almonds with a slightly bitter finish. Travelers to Tuscany enjoy many fine examples of vernaccia in the tiny village cafes and trattoria’s in and around Florence; unfortunately, there are only a few dozen producers who ship vernaccia to America, but they are certainly worth seeking out. Here are the best from the region generally available in the US: Vincenzo Cesani, Falchini, and Carpineto. Vermentino (ver-men-teen-oh). If there is a single white varietal, and for that matter a single wine region that has most excited me in the last few years, it is vermentino from Sardinia. While this grape is grown in a number of regions throughout Italy, it is the vermentino from the island of Sardegna, as the Italians refer to it, that has ignited so much interest in this previously ignored wine growing region. It is one of the more aromatic wines you may ever encounter, with intoxicating scents of wild fennel and sage, especially from the northeasterly scrub-covered and rocky terrain vineyards of the Gallura peninsula. On the palate, the wine often resembles the malvasia grape, with its melon and lemon flavors. Vermentino’s crisp acidity is an incredible match to most simple seafood preparations and this is the wine I look for when ordering a Caesar Salad to alternately contrast and complement the anchovy-laced dressing. Outstanding value vermentino producers include: Argiolas, Antinori, and Cantina Santadi. Verdicchio (ver-dee-key-oh). Indigenous to the Marches (mar-kay) region of central Italy and bordering the eastern coastal area of the Adriatic Sea, this subtle green-hued white, at its best, is elegantly dry and crisp. 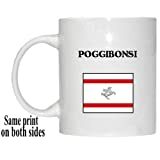 Most of the better vineyards are planted inland from the sea along the foothills of the rugged Apennine mountain range where, until recently, they produced mouth-puckering, overtly acidic wines sold in fish shaped bottles. Verdicchio’s have a distinctive nose of pine and flavors of apple and pear, and not unlike vernaccia, a somewhat bitter almond finish. In the hands of a new generation of winemakers, this is a varietal that has shed its once tarnished image and is worth revisiting, especially as a match to shellfish and most simple, grilled, unadorned fish dishes. Look for these producers: Falesco, Saterelli, and Bucci. Naples Wine News is another step in a three decade long journey in the world of wine for its founder, Bruce Nichols. First introduced to the hospitality industry as a teenager in a summer job, Bruce worked in restaurants and hotels through high school and college. In the 1980’s, in his position as Director of Restaurants for Sheraton Hotels, based in San Francisco, Bruce served as wine buyer, conducted wine education programs and hosted California winery owners and winemakers, and worked with syndicated wine writers, Leon Adams and Jerry Mead. Over the next two decades, Bruce managed the corporate food service program for a global financial company while consulting on wine programs for independent restaurants and developing and conducting wine education classes. Fast forward to late 2004, Bruce retired to beautiful Naples, Florida. In 2006, Naples Wine News was born and “A Nichols Worth of Wine”, was introduced to Naples and surrounding community wine enthusiasts through his internet-based, on-line publication www.napleswinenews.com. Wine producing countries all offer wine tours, but there are no better place than a Tuscany Italy wine tour to get to know wine and wine making at its best. You are in for an experience of a lifetime as a Tuscany Italy wine tour is not just about tasking excellent wines. You will taste and get to know the different methods of wine making and visit the cellars and have a look at how the excellent Tuscany wines are stored. It is always best to take a guided Tuscany Italy wine tour with an experienced guide because this way you will get all the interesting and finer details explained. Tour guides are knowledgeable not only about wines and wine making, but will regale you on everything about Tuscany. For people who want more out of a wine tour than tasting wine and seeing the cellars, it is important to choose the correct time of year to visit Tuscany. During certain times of the year wine tours will include seeing the vineyards and having a walk around. One thing to remember when going on a Tuscany Italy wine tour is that you will be tasting and drinking quite a bit of wine as you go along. This is all part and parcel of a wine tour, but certain safety precautions should be taken. Always make sure that you have reliable transportation and a driver available if you are not part of a tour party going on a tour bus or mini van. One way of doing a Tuscany Italy wine tour is by bicycle and explore the region at a leisurely pace as you cycle through fields and small villages. This is a great way to discover the local cuisine and stop off whenever you want to explore some of the historical sites that date back to the Etruscan period. Wine tours should never be rushed and meandering along on a bicycle is a wonderful way to discover the land. You can also go on a special walking wine tour of Tuscany that normally takes about 7 days to do. These guided walking tours take you along the wine roads of San Gimignano and Montalcino and along the way you not only go on at the different wine cellars to taste wine, you explore the Renaissance towns. The choice of how you want to do your Tuscany Italy wine tour is completely personal to suit your own preferences and Tuscany tourism agencies cater for everyone. You can count on Rick Steves to tell you what you really need to know when traveling through Florence and Tuscany. 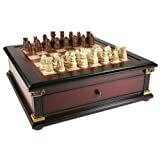 Rich, cherry finish game case with fluted columns and reversible solid wood board.